We publish interesting new music for both the pedal and the lever harp, as books and as individual scores. Click Here or on Sheet Music in the menu above for more information. We have also released 3 CDs of harp music. Click Here or on Recordings in the menu above for more information. 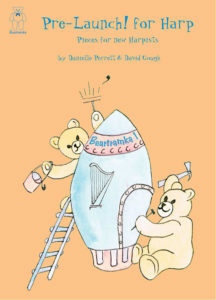 Our new book for Initial level harpists, Pre-Launch! for Harp – designed to come before our long-standing and highly popular Lift-Off! for Harp, (which is for Grades 1-2 level) – is here! We are aware that, particularly for harpists outside of Europe, the postage for music books can be very expensive. As with our other books and sheet music, there is, therefore, both a print version and a downloadable version of Pre-Launch! for Harp.